This month we are learning all about beets. Beets are a root vegetable that can be eaten raw, cooked, or pickled. You can eat the greens, too! Try beets raw in a salad, as in the recipe below. Or, roast beets with skins on in the oven at 375° for about 40 minutes. Beets are available year-round. You can find them at farmer’s markets from May through December. sugar and whisk to combine. Add ¼ tsp. salt, or to taste. Add grated carrots to the bowl and stir to combine. Add beets and mix lightly. 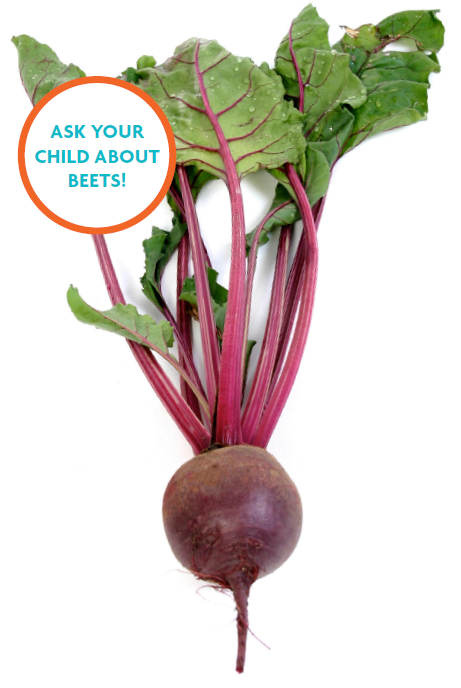 • Look for smooth, hard beets, without cuts and bruises. • When possible, choose fresh beets with green tops still attached. Greens should look healthy and green, not wilted or brown. • Store beets in a plastic bag. • Beets will stay fresh in the refrigerator for up to two weeks. Beet greens should be used within a few days. • Choose low-sodium or no salt added canned beets. and help them by using an adult hand over a child hand while they are learning.